On April 7, 2018, former Brazilian President Luiz Inácio Lula da Silva surrendered to the police and begin serving a 12-year sentence as he was given after being convicted of corruption. Named after a service station where agents initially uncovered a relatively small money laundering operation, "Car Wash" has turned into one of the worlds biggest ever examples of such a probe, netting scores of top politicians, some of Brazil's richest businessmen, and sending shock waves through Latin America. 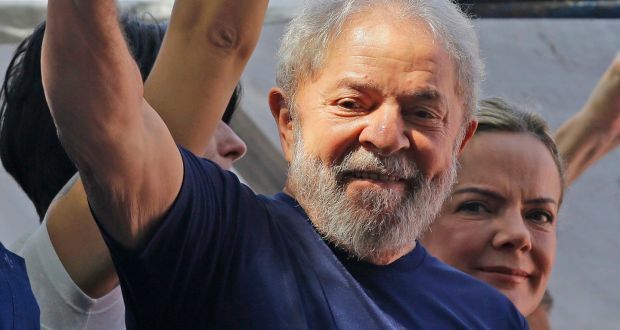 Lula was found guilty last year of taking a three-story seaside luxury apartment as a bribe from a construction company and is "Car Wash" biggest scalp -- though Lula says the conviction was rigged. The former two-term president arrived by police helicopter on the roof of the lock-up in Curitiba late Saturday. Protesters supporting Lula clashed with police outside the walls of the union building where Lula, 72, sought refuge was the launch pad for his career in the late 1970s leading nationwide strikes that helped to end Brazil’s 1964-85 military dictatorship. Officers used stun grenades, tear gas and rubber bullets to disperse the crowd. Lula delivered a speech hours earlier to a crowd of supporters of his Workers Party outside the union building in São Paulo, — "I will comply with the order,” he told the cheering crowd. “I’m not above the law. If I didn’t believe in the law, I wouldn’t have started a political party. I would have started a revolution." His new home is a roughly 160 square foot (15-meter square) cell in the federal police headquarters in Curitiba, the southern city where the "Car Wash" probe is based. On April 6, 2018, the deadline for the former president Luiz Inácio Lula da Silva to turn himself into the Federal Police in Curitiba, in the southern state of Paraná expired. Until 9 p.m (local time) the onetime leader remained inside the headquarters of a steelworkers union in the city of São Bernardo do Campo, São Paulo, where he lives. On the same day, Lula's lawyers filed a habeas corpus request with the Superior Court of Justice, arguing there are still appeals to be considered by a federal appellate court. Lula’s arrest was ruled Thursday. The petition was filed after trial judge Sergio Moro ordered that Lula should report to the Federal Police in Curitiba, in the southern state of Paraná, where he is to begin serving his sentence. The decision was taken after the Supreme Court denied the habeas corpus petition on April 4, lodged by the former leader’s defense in a bid to change a 2016 ruling authorizing arrests before all appeal possibilities are over at appellate court level. In his ruling, Moro states that, despite the possibilities to appeal Lula’s conviction, they are not able to revoke the 12-year sentence handed down by the authorities. It also marks the end of an era for Brazil’s left, which was out in force in the streets outside of the union headquarters in the industrial suburb of São Paulo where Lula’s political career began four decades ago as a union organizer.